Amino acids are naturally present in skin, as part of what’s called our natural moisturizing factors (NMFs). Within skin’s uppermost layers, amino acids work as conductors, orchestrating an incredibly complex “concert” that allows our skin to thrive and to stay hydrated. There also are more surprising benefits of these small, but potent, skincare heroes: Some amino acids work as antioxidants; however, most of them are believed to play an even greater role by helping skin create more of its own antioxidants, such as glutathione. Topically applied amino acids help strengthen skin’s natural defense system, making it less likely to show signs of aging from environmental damage. Methionine neutralizes damaging substances before they can harm skin. All amino acids included in skincare products work in combination with other ingredients that are also part of skin’s NMFs, including our favorites glycerin, ceramides, various peptides, and hyaluronic acid. The amino acids work particularly well with peptides—that’s why we include them in our Peptide Booster, a targeted product that significantly increases skin’s hydration as it reduces signs of aging. Amino acids are truly versatile ingredients that complement other beneficial skincare ingredients, from antioxidants to plant extracts to omega fatty acids. 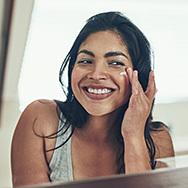 Without question, topically applied amino acids improve all skin types, and can benefit all ages, especially if your goal is to prevent or diminish signs of aging.